EBC Brakes have become the largest manufacturers of disc brake pads in the world and are worldwide leaders in motorcycle road and race brakes. They have developed a range of brake pads for every aspect of motorcycle braking for Hyosung Motorcycles. Hyosung GT125 / Comet / Pi (2003 to 2014) EBC front brake pads and rear brake pads (FA86/2) Available in either:- 'FA Kevlar' Series or 'HH' Sintered Series. Hyosung GT125R (2006 to 2014) EBC front brake pads and rear brake pads (FA86/2) Available in either:- 'FA Kevlar' Series or 'HH' Sintered Series. Hyosung GV125 Aquilia (2001 to 2006) EBC front brake pads (FA86) Available in either:- 'FA Kevlar' Series or 'HH' Sintered Series. Hyosung GV125C (2007 to 2013) EBC front brake pads (FA86/2) Available in either:- 'FA Kevlar' Series or 'HH' Sintered Series. Hyosung RT125 Karion (2002 to 2007) EBC front brake pads (FA86) Available in either:- 'FA Kevlar' Series or 'HH' Sintered Series. 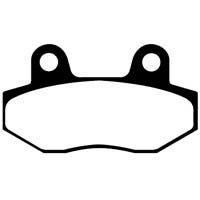 Hyosung RX125 (2001 to 2007) EBC Front Brake Pads (FA86). Available in either:- 'FA Kevlar' Series or 'HH' Sintered Series. Hyosung RX125D (2007 to 2011) EBC Front Brake Pads (FA86/2). Available in either:- 'FA Kevlar' Series or 'HH' Sintered Series. Hyosung XRX125 Enduro (2000 to 2006) EBC Front Brake Pads (FA86). Available in either:- 'FA Kevlar' Series or 'HH' Sintered Series. Hyosung XRX125 Supermoto (2007 to 2011) EBC Front Brake Pads (FA86/2) and Rear Brake Pads (FA165/2). Available in either:- 'FA Kevlar', 'Double-H' Sintered, 'TT' or Sintered 'R' Series. Hyosung Comet 125 (2004) EBC front brake pads and rear brake pads (FA86) Available in either:- 'FA Kevlar' Series or 'HH' Sintered Series. Hyosung RT125D Karion (2008 to 2014) EBC front brake pads (FA86/2) Available in either:- 'FA Kevlar' Series or 'HH' Sintered Series. Hyosung Comet 150 (2004) EBC front brake pads and rear brake pads (FA86) Available in either:- 'FA Kevlar' Series or 'HH' Sintered Series.